The garden was a wonderland this morning. The drizzle and smirr we had last night had resulted in lots of little beads of water on all the plants. I tried both macro lenses on them, but surprisingly, it was the little 30mm on the Oly that produced the PoD. 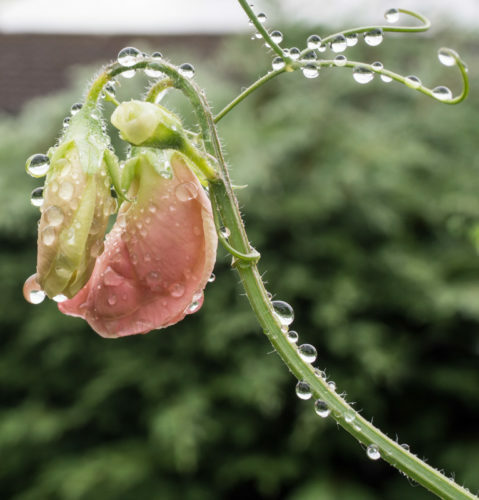 Raindrops on a sweet pea. With a photo in the bag, next on the agenda was dancin’. We left early, not knowing just how busy Glasgow would be with the start of the European Championships. Traffic was light, but we had to park two floors higher than usual in the carpark and that sort of told us that the town was indeed busy. Lots of guards round George Square, looking officious, scanning people and opening their bags. Yes, I know they have to be ultra careful these days, but this was the first real day and I think they just wanted to use those scanners! Some crap bands were belting out noise from the covered stage that had been set up in the square. People I’d never heard of, although that is no indication of their fame. At least the rain had held off. We got down to the pub, which hosts the dance class, a bit early because of our early start. The door was locked which is unusual. A class sounded as if it was in full swing though, the previous class is an advanced jive class, one man and loads of women. We decided we’d go for a walk round the block as we were a wee bit early. Arrived back just a bit before starting time and managed to get in because one of the barmen was coming out. Nobody was dancing, then the other two couples we share the class with started in on the waltz. That’s when we realised that the class was starting at 1pm, not 1.30 as usual. Oops, we were late! Soon got into the waltz and I almost mastered the turn for the second promenade. I think I would have mastered it if it wasn’t for the other two couples standing arguing right in the dancing line. Some people are so thoughtless. After we’ve finished our line, or more likely aborted it, we clear out of the dancing space, but these other couples don’t bother and walk right in front of you. One day soon there will be a collision and there will be no dash cam to record it. After the waltz we had a short go at ballroom Tango. It’s about as much like Argentinian Tango as Ballroom Salsa is like Cuban. It was still difficult enough for me. Then it was jive time and we were attempting to master the first six spins. Almost did it too with a little help from Scamp telling me what spin came next. Still a bit of practise needed there. The place by this time was melting. Sweat was dripping from all of us. I think they must have had the heating turned up. Cup of coffee in Nero to cool down, then back home. Dinner was Aloo Saag from the Bosh book and although it is fiddly to make, it tastes very authentic. Best of all, there’s enough for tomorrow too. That was about it. The rain that threatened all day finally arrived just about 4pm and outstayed its welcome. It’s becoming a bit of a pain now. Enough rain! Go and play somewhere else. We’ll tell you when we need you again. Tomorrow? Maybe the dreaded Decathlon at Braehead. Worse still, it may also include a visit to IKEA!